A Must Have For All Medical Laser Personnel! Introducing LIA's New CMLSO best practices book. Medical personnel in charge of the safe use of lasers for therapeutic procedures have a valuable new tool to help prevent harm to patients and health-care professionals. 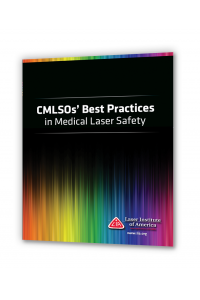 The Laser Institute of America has assembled the expert knowledge of leading certified medical laser safety officers in a new book, CMLSOs' Best Practices in Medical Laser Safety.The book compiles the latest knowledge about establishing a medical laser safety program, including laser safety regulations, how to control and evaluate such programs, and the duties of LSOs. The 11-chapter book focuses on topics such as initial LSO duties and responsibilities, beam and non-beam hazards, and factors that determine laser-tissue interaction. The book’s contributors also address the importance of safety audits once a laser safety program has been established. Packed with useful figures and tables, the book includes samples of a medical laser safety inspection checklist, a laser inventory sheet, a laser procedure record, and laser safety audit forms. Dennis and Terry, both certified laser safety officers of the LIA affiliate organization Board of Laser Safety, stress the importance of LSO training as lasers perform roles in surgery, diagnosis, treatment, DNA research, and MRI systems. “The growing prominence of lasers in medicine is rapidly approaching the point where no physician’s education will be considered complete until their training has included some experience with basic laser physics and applications,” Dennis notes. A properly trained LSO is key to establishing a laser safety program that meets the needs of the medical facility and its culture.